This post was written for PolicyMic and can be found here. Much has been written about Carlos Arredondo, "Boston’s Cowboy," who has been ubiquitous in photographs and videos from yesterday’s tragic terrorist attack. But his story deserves to be retold. Born in Costa Rica, Carlos came to America a self-employed handyman. A father of two, his oldest son, Alexander, joined the Marines because he was "Too poor to go to college," his stepmother stated. In 2004 Alexander was killed in Iraq at 20 years of age. Distraught, Carlos and his wife became ardent peace activists. They wished to spare other families the tragedy that had befallen them. At present, 6,648Americans have died in Iraq and Afghanistan. But the wars have taken lives at home, as well. In late 2011 his remaining son, Brian, who never fully recovered from the loss of his brother, committed suicide. While Brian never served in the military, the effect of war on families has been heavy during the past decade. Eighteen veterans a day commit suicide. Less is known about the families they leave behind. Facing yet another unimaginably tragic loss, Carlos and Melida re-directed their energies to the cause of suicide awareness, especially those which are military-related. While Carlos is also a Red Cross volunteer, he was at the Boston Marathon Monday primarily to support John Mixon, who was running in Alexander’s honor. 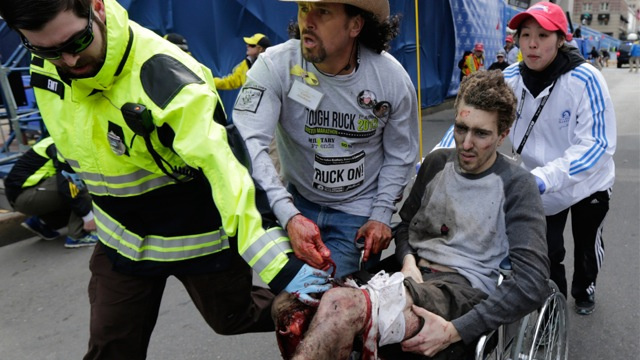 As soon as the bombs exploded, Carlos ran toward the victims to help in any way. He can be seen here (use discretion) applying a tourniquet technique in order to save a victim’s leg. In an interview where he is clearly in shock and still covered in the blood of those he saved, he describes his terrifying experience. The story of Carlos Arredondo has been inextricably linked to political questions Americans have been wrestling with for years: immigration, education costs, war, mental health, and the recent cases of mass violence. Because of this, many of us can find a personal connection to the Arredondo family. We can all put ourselves in their shoes. This is why it is powerful. But why it is important is because Carlos displays the amazing resiliency of the human spirit to keep fighting. He has not shied in the face of adversity and tragedy. Instead, he and Melida have worked for nearly a decade to try to make this world a safer place. And yesterday Carlos unflinchingly put himself in harm’s way to save the victims of senseless violence. Soon our nation will go through yet another round of mourning, followed by finger-pointing and political deadlock. While this is going on here in Washington, remember the story of the Arredondo family. That same human resilience and heroism Carlos has shown runs through each and every one of us. Ask yourself, how can I make this world a better place? While you may feel small, every individual can have a part in mending the wounds of our society. And trust me, we are going to need all the help we can get.